HA: Nicole, welcome back to Homeschool Authors. Nicole: Thank you so much for having me! Nicole: The idea for this book sprouted when I read about a real-life setting in another country that included young people hiding from "death-squads." Then I read Hebrews 13:12-14, and those became the theme verses for the book's 3 parts. 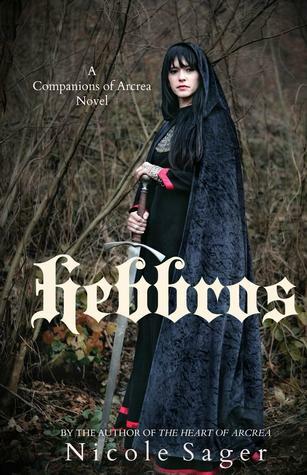 The setting for Hebbros was decided on when I finished writing the Arcrean Conquest series and didn't want to leave the world of Arcrea behind! Nicole: Having just released in May, I haven't had much feedback for Hebbros. However, I will say that I was very encouraged when my mom read it and started crying on the first page. She knew the premise of the story and felt the emotion building immediately. I'll be sharing her review later this week, as well as one other. Nicole: Reading! I'm a huge fan of Historical Christian Fiction, especially those set in the late 1800s. I'm also usually drinking a cup of coffee. Nicole: I plan to catch up on some Karen Witemeyer and maybe try a few new authors. The Ladies of Sumerhill are also calling my name from the shelf, as is Maureen Lang... So many choices! Nicole: Every time I'm asked this question, I have to reply with MaryAnn Minatra's Alcott Legacy series. Every scene, no matter how small, connected the story in some way. Her characters are rich, and the historical setting is captivating. If I could read any series for the first time again, I would choose this one (and I'm thinking I may just need to read them again anyway, first time or no!). Nicole: I have a series that I wrote some years ago that I'm planning to edit for publication. The stories are sound, but the books are crying for an editor's touch! The series takes place in yet another fantasy world, but this time the stories are a bit more allegorical (and one is what I consider my first ever tragedy!). Lord willing, I'll have some or all of these ready for publication by the end of the year. HA: What should readers expect when they read Hebbros? Nicole: A journey. The story of Hebbros spans 15 years and follows a multitude of characters, all with different backgrounds, depths, and issues. My hope is that readers will find themselves relating with one or more characters and experience a roller-coaster of emotions as they witness the trials and triumphs that life brings. Nicole: I'm so happy to be included in the excitement with Homeschool Authors this summer! I want to encourage anyone reading this, whatever your talents may be, do all for the glory and honor of God! Get Hebbros this week for only $0.99 cents, read it, review it, and enter for a chance to win it!